Jean-Marie Faustin Goedefroid "João" de Havelange (born May 8, 1916 - 16 august 2016) was a Brazilian association football administrator. He was the 7th President of FIFA (Fédération Internationale de Football Association). He was elected to the position in 1974. He resigned in 1998, after 24 years in charge. He was elected as an honorary president of FIFA in 1998 after he left office. He resigned in 2013 due to "health and personal reasons". Havelange was a swimmer at the 1936 Summer Olympics in Berlin. He was also part of the team that tied for 13th in water polo at the 1952 Summer Olympics in Helsinki. ↑ "FIFA Presidents". FIFA. Retrieved 2013-12-19. ↑ "Uefa chief backs Germany". BBC News. Retrieved 2013-12-19. ↑ "Joao Havelange, Fifa's honorary president, resigns over bribes". BBC News. Retrieved 2013-12-19. 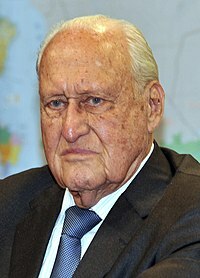 ↑ "João Havelange Bio". Sports Reference. Retrieved 2013-12-19. ↑ 5.0 5.1 5.2 5.3 5.4 "João Havelange confirmed for Soccerex in Rio". Soccerex. Retrieved 2013-12-19. This page was last changed on 2 April 2018, at 00:21.